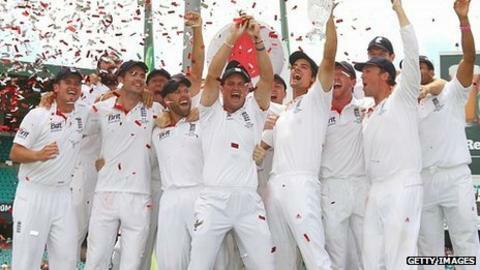 England's cricket team heads the list of a record six British nominations for the 2012 Laureus World Sports Awards. Andrew Strauss's side, who climbed to the top of the Test rankings this year, have been included in the world team of the year category. They face strong competition from Rugby World Cup winners New Zealand, Formula 1 team Red Bull and Champions League winners Barcelona. US Open champion Rory McIlroy is nominated for breakthrough of the year. Mo Farah, who won 5,000m gold and 10,000m silver at the World Championships, is also included in the breakthrough category. McIlroy's fellow Northern Irishman Darren Clarke is shortlisted for comeback of the year. Wheelchair racer David Weir is included in the world sportsperson of the year with a disability nominations, while BMX rider Jamie Bestwick is included in the action sports section. Barca's Argentine playmaker Lionel Messi is in the running for sportsman of the year for a third successive year. The awards ceremony, which recognises sporting achievement during 2011, will take place at Central Hall, Westminster on 6 February, the first time it has been held in London.